Note: Updated information is available for setting up Pushover and using new features specific to the Funnel Cake release of the CGM Remote Monitor (Nightscout site). See Pushover in Funnel Cake for more information. Pushover is a service that allows Nightscout to push messages to iOS, Android, and desktops in a very reliable way. The initial integration is ONLY related to the new Care Portal feature, with this integration a push notification will be sent using pushover to your, phone, pebbles, and desktops. Later we expect Pushover to be used for other notifications. You’ll need to Create a Pushover Application. You only need to set the Application name, ignore all the other settings. If you only have 1 Nightscout site name the Application “Nightscout,” if you have multiple site (2 T1 kids, etc) you can create 2 Application with the other names (kids’s names) to make it more clear who the notification is for. With those 2 key you’ll need to set 2 environment variables, just like you do for your Mongo URI. Where do I set the environmental variables and enter my 2 keys from Pushover? I posted a question about this on the facebook group, but I also just re-read this setup guide. Am I reading correctly that for now pushover is only sending notifications for entries using the careportal and not for high or low thresholds being hit? I got the care portal installed…up and running. Confused about how to get the info entered pushed to my watch. Pushover is installed and keys established. Still confused where I need to input those to get it functional. Also, were you saying you needed a screenshot of setup in mongo from me? Jessica: Yes, currently pushover is only used for care portal entries, I’m sure it will be extended. Travis, I identify with your question. Apparently although these work in the app section they should be set in the connection strings section instead. I downloaded pushover to my iPhone… everything works and I got the care portal notification on my iPhone, BUT… if I am understanding correctly, and if I want the care portal push notifications to come to the Pebble, I have to set ALL notifications for ALL apps on my iPhone to come to my Pebble? 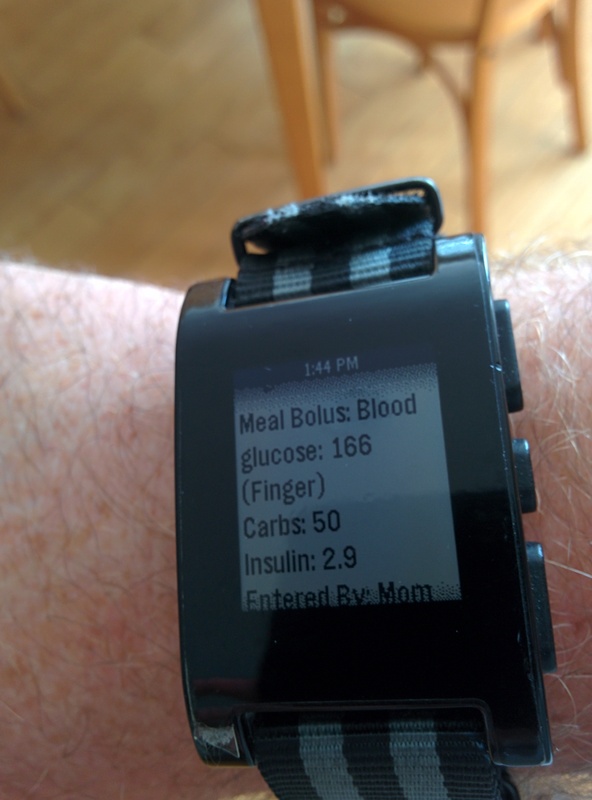 Can I install the pebble and pushover apps on my android uploader phone and have them set up to send care portal info to my watch if I’m not the one wearing the rig? My daughter will have the rig with the android uploader at school with her… just want to be sure that if I upload and set up the android that stays with her the way I just did it all on my iPhone, that it will send still… please let me know.